Emilio Segrè, an Italian/American physicist, was born Feb. 1, 1905. Segrè worked with Enrico Fermi in Italy in the 1930s and was one of the 5 authors (first image) of the famous “slow neutron” paper of 1934 which showed that neutrons, slowed down by passage through paraffin, were much more likely to interact with nuclei, making possible the discovery of nuclear fission a few years later. In 1938, Segrè was working at Berkeley in the U.S. when Mussolini declared that Jews were persona non grata in Italian universities; Segre stayed on as an assistant to E.O. Lawrence and soon established himself as a first-rate nuclear physicist. He was invited to join the Manhattan Project in 1943. His major contribution to the bomb effort was in demonstrating that the “Thin-Man” plutonium bomb design, to which Los Alamos was fully committed in 1944, would not work. 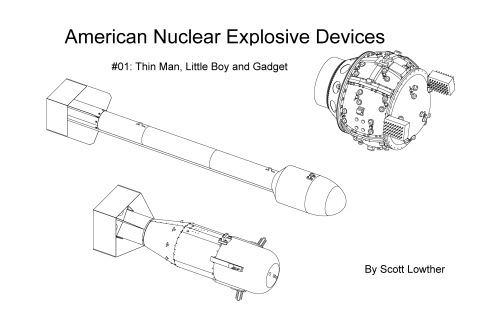 As its name suggests, Thin Man was a 17-foot long narrow cylinder (second image) in which a “bullet” of plutonium-239 would be accelerated at high speeds toward a plutonium target, instantly creating a critical mass and a nuclear explosion. Segrè tested the plutonium-239 being produced by the reactors at Hanford and found that it was contaminated with a small amount of plutonium-140, which had a high spontaneous fission rate, which meant that the bomb would go off before the bullet reached its target and produce only a fraction of its intended yield. The Project immediately switched over to an implosion design, called Fat Man, and this was the bomb exploded at the Trinity test in July of 1945 and over Nagasaki less than a month later. In 1955, again working at Berkeley, but now at their new Livermore Laboratory, Segrè and a collaborator were the first to detect anti-protons, which had been predicted by Paul Dirac 22 years earlier. For this achievement, Segrè shared the Nobel Prize in Physics for 1959. Many scientists take up writing history in their later years, and most are lousy historians. Segrè was the exception – he wrote an excellent biography of his compatriot Fermi, who had also fled Mussolini’s Italy and succeeded in building the first atomic pile at the University of Chicago in 1942. Enrico Fermi, Physicist, was published in 1970. I was surprised to discover that in over four years of writing these daily posts, we have never displayed the cover of Time magazine for Jan. 2, 1961 (fourth image). 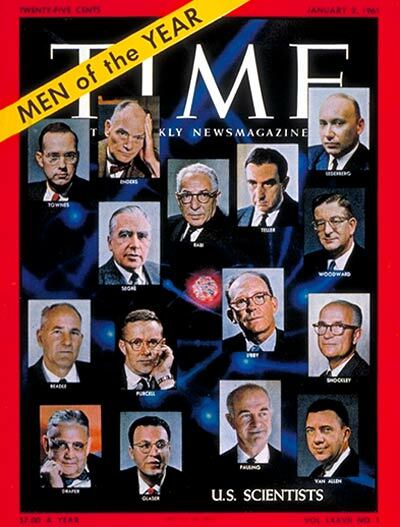 This cover is somewhat notorious because, in its 37 years of previous existence, Time had rarely featured scientists as cover figures, and then suddenly, they put 15 on the cover at once and declared them collectively “Men of the Year [for 1960]”. We show it here because Segrè was one of the fifteen, having just received his Nobel Prize; he is in the second column from the left, second from the top. Others honored were Linus Pauling, William Shockley (co-inventor of the transistor), and Willard Libby (discoverer of carbon-14 dating). Almost shocking are the five that were not included: James Watson, Richard Feynman, Luis Alvarez, Hans Bethe, and Edward Tatum. All were already quite accomplished in 1960 and all would receive Nobel Prizes before the decade was out. Hindsight is such a powerful leveler; one would think it would humble us a little, but it doesn’t seem to do so.